The Xiaomi Redmi note 4 is the newest member of the Chinese mobile giant XIAOMI and it's also the fourth of the Redmi note series which consists of Xiaomi phablets. 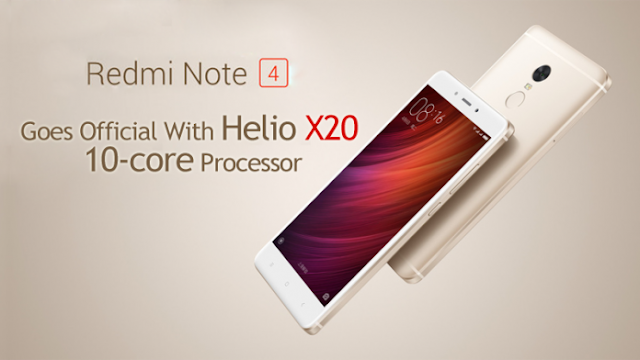 The new Redmi note 4 is the sucessor of the popular redmi note 3 which was launched early this year. Although the new Xiaomi Redmi note 4 looks very similar to the note 3 in terms of physical appearance, the note 4 comes with a newer upgraded Android version, better processor, larger battery capacity and some other few upgrades. The Xiaomi Redmi Note 4 features a 5.5-inch IPS LCD display with a resolution of 1920 x 1080 pixels as well as 450 nit brightness. It's also runs on Xiaomi’s latest MIUI 8 which is based on Android version 6.0 Marshmallow. The device is covered in an all-metal unibody and has an entire dimension of 151 x 76 x 8.35mm, weighing in at 175 grams. The device has a design which resembles closely, previous Redmi series smartphones, notably the latest Redmi Pro. The Device is powered by MediaTek Helio X20 Deca-core chipset with a clock speed of 2.1GHz. In terms of RAM size and internal storage, this phone comes in two different versions, the first variant has a 2GB RAM + 16GB internal storage and while the other one has a 3GB RAM + 64GB of internal storage. Both internal memory spaces can be expanded with a microSD. In terms of camera quality, the Xiaomi Redmi Note 4 has a 13-megapixel rear facing camera with f/2.0 aperture, color temperature flash, PDAF and HDR. The rear camera also has the ability to record at a maximum resolution of 1080p at 30 fps and 720p slo-mo at 120 fps. It also features a front facing selfie camera 5-megapixel which comes with Beauty 2.0, f/2.0 aperture and facial recognition. The Xiaomi Redmi Note 4 comes with a fingerprint scamner just below the camera, it supports 4G VoLTE network and also features dual SIM and dual standby modes. This device is powered by a massive 4100mAh lithium battery. The Xiaomi Redmi note 4 with 2GB RAM + 16GB ROM version is said to retail for 899 Yuan (US $135,) which is around Rs. 9,050 in India, N40,500 in Nigeria and Ksh 13,678 in Kenya. while the 3GB RAM + 64GB ROM version retails at 1199 Yuan (US $180) which is about Rs. 12,068 in India,N62,000 in Nigeria. and Ksh 18,238 in Kenya .